I would like to quote an Israeli Prime Minister speaking on situation in Egypt, “The State of Israel wishes to see a free, independent and progressive Egypt. The stormy developments there may contain positive trends for recovery and progress, and we view them with favor.” This is not Benjamin Netenyahu. This is David Ben Gurion in 1962 speaking on the sitaution in Egypt after the revolution or the coup of Nasser, overthrowing King Farouk. You can listen to the full program, along with the question and answer session, which focused quite a bit on the prospect of a unilateral declaration of Palestinian statehood and its possible endorsement in the United Nations. When I first learned of the ill-fated Israeli raid on the Gaza Flotilla boat Mavi Marmara I got a sick feeling in my stomach. Why? Because something had gone horribly wrong and already I was preparing myself for the recriminations that would be hurled against an Israeli state that I love at an elemental part of my being. Because there was a dizzying element of multiple asymmetries to the whole story as it unfolded: protesters versus soldiers, paintball guns versus knives and lead pipes, a dozen soldiers (each like my “brother” from my mishpacha me-ametzet) versus hundreds of violent opponents, nine dead people versus unspecified injuries, occupied Palestinians versus powerful Israelis, a tiny Jewish state versus a host of hostile neighbors that would smile on its annihilation. Because while I consider myself an unambiguous Zionist, I have great misgivings about this whole episode, from the motivations of the Turkish organizers who set it in-motion to those who would defend every aspect of Israel’s handling of the affair and question the loyalty of those who think otherwise. As I followed events on my Blackberry as they developed on Monday afternoon, I just kept saying to my wife, “This really upsets me.” But I couldn’t articulate beyond that. When I came into work on Tuesday I felt like I needed to provide the beginnings of a process to make sense of this for myself, and so I picked-up the phone and called my colleague at the Embassy of Israel to arrange for a free and open to the public briefing from an Embassy spokesperson this Friday at 8 am. All are welcome. In the short time the event has be open for registration, I think I can conclude that I am not the only one with questions. As I began spreading word of the event I got a note from a friend who asked, “Are [you] taking the Embassy line on the flotilla situation? Or are [you] allowing for the Jeffery Goldberg / Amos Oz view to be articulated as well?” My response was that I (or the Washington DCJCC for that matter) am not taking anyone’s line. That’s not what we do. That’s not what this is intended to be. This is the start of a conversation. Or perhaps it is the continuation of a conversation we’ve been having since 1948. Or 1967. Or 70 C.E. In either case, it is not meant to be the totality of the conversation, only a point of departure. And it is my hope that it will not be an event where the audience passively absorbs without question everything that is asserted from the podium. My hope is that we can talk to each other. We’re starting with the Embassy, and while they won’t be there, I am sure Amos Oz and Jeffrey Goldberg will have their people in the room. And if we’re lucky, so will Alan Dershowitz, David Grossman, Marty Peretz, Max Boot, John Podhoretz, Gershom Gorenberg and Bernard-Henri Lévy. They are all welcome, because we all have to contend with a post-flotilla reality. I don’t care if the Palestinians or their allies don’t “indulge” in this level of communal introspection. Perhaps they already do, we just aren’t privy to those conversations. Perhaps they will some day, or never will. It doesn’t truly matter to me. To abstain from discussion in the name of solidarity strikes me as the least Jewish thing we could do at a time like this. Whatever our separate conclusions, the goal is shared, a Jewish democratic Israel secure in its borders, at peace with its neighbors, and in-touch with its highest values. You can register for the briefing here. Why Do a Reading of Caryl Churchill’s “Seven Jewish Children” at a Jewish Theater? You can understand the outrage. Imagine it: a non-Jewish, British playwright has the temerity to write something as provocative as the line, “The Jews do not belong here” and a Jewish theater, in a fit of obvious self-loathing, gives that voice a venue by placing it on its stage. I am not speaking of the sudden controversy surrounding Caryl Churchill’s short-play, Seven Jewish Children which the Washington DCJCC’s resident professional company Theater J will present readings of this week. Rather, I am referring to the same Theater J’s production of David Hare’s Via Dolorosa nearly a decade ago, in the fall of 2000. Back then we knew we were undertaking something with the potential to be controversial for its outsider’s observations of the Israel-Palestine conflict. We braced ourselves for outrage. We prepared our leadership for potential protests, even boycotts. We were not doing this merely for controversy’s sake, but because of our belief, that the work – consisting mainly of Mr. Hare’s channeling the voices of the various Israelis and Palestinians he met – confronted us with a challenging and artful portrayal of ourselves and our Israeli cousins. But so concerned were we about the potential for outraged audiences that we built into the presentation of the play a response vehicle, “The Peace Café” co-created by artistic director Ari Roth, Theater J councilmember Mimi Conway and a frequent participant in Arab-Jewish dialogue, restaurateur and Iraqi-American Anas Shallal. Following the performances, audiences gathered around tables, broke bread and picked from a menu of discussion questions and quotations of some of the play’s most provocative lines. In spite of all our fears, or perhaps because of them, the tidal wave of controversy never materialized, but the Peace Café experience gave us a model with which to engage more controversial material in the years to come. Meanwhile, the work itself, Via Dolorosa has gone on to productions both at other Jewish theaters and in Israel itself. If you have an opinion in this matter I hope to G-d you’ve taken the time to read the seven pages of verse that’s causing all the ruckus. I have neither the space nor the charge to do an explication of the work here, but if this is to be a Jewish argument, which is to say, an argument amongst Jews, then I hope we can all work from the source text and not just the commentaries. The lines can be shared out in any way you like among those characters. The characters are different in each small scene as the time and child are different. They may be played by any number of actors. The result is that it becomes difficult to find an authentic and specific Jewish voice in a work so broad that it is somehow attributable to all Israelis and no Israelis, to all Jews and yet no one Jew. Which speaks pointedly to the fact that while David Hare traveled the land of Israel gathering the cacophony of voices in his play, Ms. Churchill participates in an obstinate cultural boycott of Israel and does not even permit her works to be performed there. So there’s two strikes against Ms. Churchill. Let’s even throw in for argument’s sake that maybe she’s also a bit of an anti-Semite. That doesn’t take away from the power and verisimilitude of the compressed language she puts on the page for I would argue, five-sixths of the short work. That last part, suffers not from the caricature of a racist, belligerent, ultra-Nationalist (anyone caring to read material equally offensive but of more estimable provenance need only peruse Amos Oz’s essay “The Tender Among You and Very Delicate” from his collection In the Land of Israel ); but its lack of attribution. So why bother putting her generic opprobrium on our authentic Jewish stage? Why sully ourselves with the association? Because the only way to parse that which carries the merit of specific resonance from that which sinks under weight of shapeless assumptions is to inject the Jewish voice back into the monologue. To engage the work and respond to it with Jewish voices like Robbie Gringras and Deb Margolin, and the intelligent audience members that have sought us out for years now because of our mission to engage and discuss the most pressing moral and political issues of our time. To decide for ourselves after hearing a collection of generic poetics placed in the mouths of specific actors whether they land with the force of truth or disappear with the speed of your average smoke screen and with just as much substance. Ultimately, precisely because it is about us, we owe it to ourselves to apply our skills as artists and our intellectual rigor as audiences to divine what the worth of this piece is. I suspect Israelis are going to want to hear for themselves (although I would demand that they be allowed a production of Top Girls or Cloud Nine in exchange) and decide on their own whether or not they feel blood libeled. Ultimately, what Ms. Churchill has written “for Gaza” will be less important than the conversation Israelis have with each other as new accounts by IDF soldiers are published in Ha’aretz and Ma’ariv. And while she’s no Shakespeare, the Bard himself never visited Italy, but still managed to write The Merchant of Venice. On second thought, let’s not go there. Not today. “L (A) T T I T U D E S”–an exploration of maps of Israel and Palestine created by ten contemporary artists, opened last week in the Ann Loeb Bronfman Gallery. You can view elements of the entire show at their virtual gallery. Unquestionably the boldest piece of work on display, both for its physical presence and unambiguous ideological declaration, is Avner Bar Hama’s “Orange Map: Today Gush Katif–Tomorrow Jaffa.” And while the works on display are in several different media including photography, fresco on wood; paint, ink and goache on paper and collages using all sorts of maps; undoubtedly the most unusual medium is Bar Hama’s use of artificial oranges and “Jaffa” stickers to create a 25-foot map of Israel on the floor of the gallery. For the uninitiated, orange was the color embraced by Israeli settlers opposed to the 2005 unilateral withdrawal from the Gaza Strip and the Israeli army’s dismantlement of the settlements (among them were some 17 that comprised a bloc known as Gush Katif). Once you know that, and that in addition to being a variety of orange, Jaffa is also a city located directly next to Tel Aviv, the title sort of says it all. Rather than delve more deeply into the political culture behind the work (or for that matter, the politics behind works in the exhibit that come from a markedly different perspective), we thought it would be interesting to post a brief photo essay of how 1300 artificial oranges become a map of Israel. In Case You Missed It: What Makes An Army Jewish? A Dialogue. 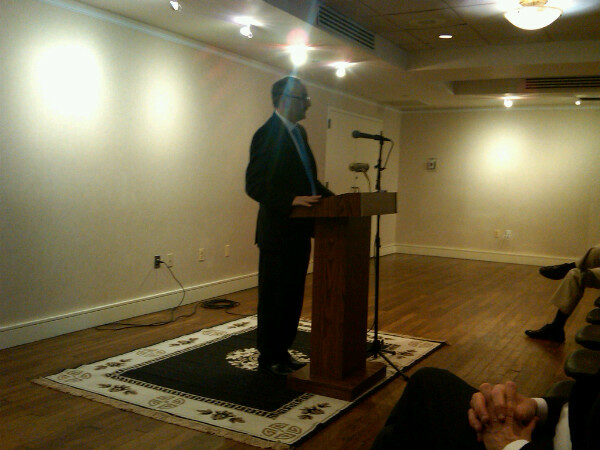 Stephen Stern, the 16th Street J’s Director of Dialogues and Public Affairs sends an account of this past week’s riveting dialogue. Thursday night, February 14, a ruach of intense dialogue pervaded the Center’s Ina and Jack Kay Community Hall, as nearly fifty participants remained riveted for a two hour plus exploration, “What Makes a Jewish Army? Ethics and Tradition: The IDF in an Age of Checkpoints, Village Sweeps and Targeted Killings”. 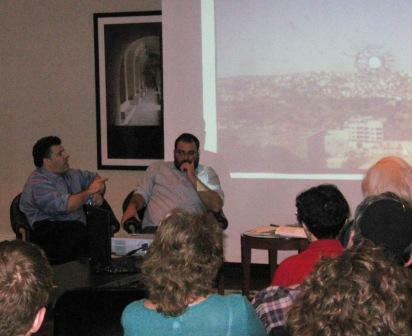 Two passionate IDF veterans recounted their experiences and their starkly different conclusions, listened deeply and challenged each other, responded to fifteen varied and vibrant interrogations from the audience, and spoke to modern dilemmas in light of traditional Jewish questioning framed by our sublime colleague, Jewish educator Avi West of the Partnership for Jewish Life and Learning. This is my brief introductory account and an invitation to continue this dialogue. I seek responses to this blog from our panelists, that night’s audience, and those out there who want more of this.